Marion: City of Blades is the second book in Robert Jackson Bennett’s THE DIVINE CITIES series, which tells several sides of the story of a major international cultural conflict. Saypur, a civilization that has been oppressed by the Continent for centuries, rose up and subdued its oppressors by killing their gods. In the wake of the Saypuri revolution and its conquest of the Continent, all of the Continental Divinities have vanished, and magic no longer works… usually. City of Blades, Bennett’s follow-up to City of Stairs, takes place five years after the events of the first book. Voortya, the Divinity of War, was the first god killed by the Saypuri folk-hero called the Kaj, and with her death the city of Voortyashtan collapsed. Shara Komayd, the protagonist of the first book, is the prime minister in Saypur, but she is having a rocky time of it. The problems in Voortyashtan are adding to her difficulties. She sends General Turyin Mulaghesh, a decorated war hero, to the ruins of Voortyashtan on a routine inspection. Mulaghesh soon discovers that very little is routine. A Saypuri operative has disappeared from the city, an engineer has discovered a metal ore that conducts electricity with astonishing efficiency, and there have been murders and mutilations — specific mutilations that bring back terrifying memories of generations of Saypuri enslavement at the hands of the Continentals. Everyone has secrets, even Turyin — or, if not secrets, memories she desperately wants to suppress. Bennett creates a convincing spy-drama mystery, a crackling good action adventure blended with believable magic, and takes on big issues; creativity and destruction; war, ethics, and loss; the power of cultural memory and the power of a promise. As we see that the magic of Voortya survives the death of the divinity herself, the tone shifts from suspenseful, shadowy mystery to nail-biting action at the city’s waterfront, in the newly excavated mines and in the City of Blades itself. The story twists and turns; there are surprises, there are battles, and because it is a book about destruction and war, there is loss. Bennett does not take the easy way out; we lose characters we care about. I don’t remember the last time I read a book that was this exciting and this affecting at the same time. Kate: If you loved City of Stairs like I did, it was a joy to see Turyin Mulyaghesh, one of Sigrud and Shara’s sidekicks in that book, star as the protagonist in City of Blades. Having her as the main character gives readers a new vantage point on the other characters we loved from the first book. When we’re not in Shara’s head and privy to her thoughts, she seems almost as inscrutable and ruthless as her aunt did in the first book. Sigrud is showing more signs of age and weakness than he was in the first book, but we also get a stronger sense of his physical attractiveness through Turyin’s eyes. It’s noteworthy that Bennett can create characters who seem real and consistent, while revealing new aspects of these characters as seen from a different perspective. And this realization, this bright, brittle memory, formed a tiny crack inside her, and suddenly she understood what she’d done, what they’d all done, and she burst into tears and sank onto the ground. As such, this book felt much more emotionally raw than the first book did. In City of Stairs, Shara was a Sherlock character feeding on tea and the high of a mystery, with the addition of wonder; even though she’d been brought up to fear and abhor the divine, she loved the gods and their mysteries. Sigrud was a cipher, and Turyin provided sarcastic color commentary. Here, in City of Blades, we see sides of all three characters that we never expected. If you want to find out what can make Sigrud cry, read this book. If you want to find out what can make Sigrud see red… actually, that chapter is too painful. Marion: Oh, my God. That chapter. Kate: That’s my point. There’s a lot of pain in this story — more than there was in the first. The first was characterized by curiosity, longing, wonder, and regret; this one is characterized by pain, guilt, and that sickening sense of dissociation when you find out that you’re capable of more violence and destruction than you ever thought possible. This is Bennett’s paean to the worst in human nature, without celebrating it, without mystifying it, and while still recognizing that there is good alongside the bad. Marion: City of Blades deals with cultural Post-Traumatic Stress: Both Saypur and the Continent suffer from cultural trauma; Saypur, from the memories of terror and enslavement; and the Continentals, who tumbled from a place of power and privilege and lost their religion at the same time. Both societies are wounded, and each one is acting out some of worst behaviors; some Saypuri are corrupt and treat the Continentals badly, exacting petty revenges and using pejoratives for them, and some Continentals resort to acts of terror against the occupiers. the sound of steel on steel, the sight of distant flames, the rumble of horses’ hooves…. this is no mere sculpture: the hand is real, sacrificed by a man long ago to his divinity, and through the sacrifice of his son she became exceedingly powerful, and this sacrifice was memorialized on stones and books and pieces of armor, the hand clutching the blade, the sacrifice paired with assault. For me, this story evokes the Old Testament story of Abraham sacrificing Isaac on the word of his God, but Bennett turns its purpose around. Instead of having us ask what God gave Abraham in return, he makes us ask what God got out of the deal — what divine powers were bestowed as a byproduct of the ritual of sacrifice. Marion: Bennett also explores the creative and destructive impulses. There is a myth in the story about Voortya having to partner with Oshana, the divinity of creativity and growth, to accomplish something. On the human level of the story, we see Mulaghesh contrasted with another famous Saypuri, the builder and engineer Thinadeshi. If Thinadeshi represents creation, is Mulaghesh the destructive impulse? She certainly seems to think so. This leads to the emotional climax of the book for me. Because of what she did long ago, Mulaghesh is the only person who can do what needs to be done at the end. You noted earlier that each side has sins and heroes; this book takes a wide-open-eyed look at the heroes who commit the sins and how (and if) they ever reconcile those actions, ever redeem themselves truly. Kate: That is a great point, Marion. I noticed a lot in City of Blades about the passage of time. Time has taken its toll on Shara, on Sigrud, and on Turyin. I’m sure Turyin’s age was mentioned in City of Stairs, but I never felt it very keenly, other than knowing that she was looking forward to retiring in Juroshtan. Here, I get the sense of an old dog on its last legs, on its last round, a general just trying to fill in the last gap of time, who didn’t expect to see much action, and for whom the action is very surprising and difficult. Sigrud is just beat to hell. And Shara is also older, the lines showing on her face, exhaustion of her position taking its toll. Marion: And this is a book about secrets; aspects of Turyin’s life, and of Sigurd’s, are revealed, and even Shara has something she has kept from nearly everyone, and it’s interesting that at the end, that secret is “accidentally” revealed to Turyin. And I’m not completely sure I believe Shara’s earnest explanation. Through all of this, I love Bennett’s prose. It’s almost liquid. Most writers working in present tense can’t help but sound mannered or self-conscious; these books never do, and it’s only at the end that I think, “Oh, he wrote that whole thing in present tense.” I’m not sure how he does that! Kate, I’d love to know what you think of the world-building in City of Blades. Kate: Oh, man, it’s so great! Bennett’s world, specifically his Voortyashtan, grows so naturally out of the mythology he’s created that his choices seem inevitable. The shamanic hut made of beaten swords, the Voortyashtani afterlife filled with warriors, the mask of the sentinels that upsets Turyin in the museum — they are all of a piece with the story he’s telling us about this land. But he also manages to surprise us, combining ancient ruins with the new Dreyling construction in the harbor, contrasting stories of ancient Voortyashtani warriors with the modern-day warfare of the Saypuri soldiers. This aspect of the book ticked all my nerd boxes and I wouldn’t be surprised if there are many readers who, like me, secretly wish Bennett would come out with an encyclopedia of the world he’s created. Marion: I think it’s safe — very safe — to say we both loved this, and if we go on we’re both going to be reduced to shameless fangirling. (Not that there’s anything wrong with that!) This book is the first book on my “Best of 2016” list. Kate: I totally agree. A fantastic book, in what is turning out to be a marvelous series. Now we just can’t wait to meet Bennett at WorldCon in August! Next time you’re in one of those annoying arguments with someone displaying their ignorance of the genre by sniffing about it being “escapist fare” lacking in depth, substance or relation to our modern world, don’t bother talking. Just hand them Robert Jackson Bennett’s newest work, City of Blades, and walk away. No need for words because, believe me, you just won. City of Blades is perhaps the most moving, most powerful exploration of war I’ve read since Tim O’Brien’s classic The Things They Carried. Bennett’s novel may not have the structural and stylistic brilliance of that work, but due to its evocation of war’s lingering impact on not just the individual soldier but also on the countries involved, its searing indictment of those who glorify battle or speak/act casually with regard to war, and its unblinking examination of all the horrible choices war places before individuals and nations, City of Blades is a lock for my Best Books of 2016 list. And no, I don’t mean Best Fantasy/Sci Fi Books. And yes, I realize it’s only January. I stand by that guarantee. It’s that good. In returning to his DIVINE CITIES universe, Bennett chooses as his main POV character General Turyin Mulaghesh, whom we last saw in the first book, City of Stairs, albeit in a smaller if still significant role. Here, she is sent by Shara Komayd (one of the major characters in the first book) to Voortyashtan, a restless, “backward” part of Saypur’s empire. Like many of the Continent’s cities, Voortyashtan had its own divinity, this one being Voorya, the goddess of war, who invested her soldiers (“Sentinels”) with great power and sent them forth to wreak death and destruction in the world. As we saw in the first book, when Saypur rebelled and conquered the Continent, the divine beings were slain and their miracle creations mostly either disappeared or ceased to work. Since one of Voorya’s miracles was an afterlife to keep all of her Sentinels until they return in an apocalyptic bloodbath, that’s probably a good thing. But as we also learned in City of Stairs the deaths of all the gods and/or their works may have been greatly exaggerated. So plot-wise, we have a possible existential threat to Saypur and the larger world. We have fears of the Divine working in the world again, with all its incumbent peril. We have a murder mystery — a young Saypuri woman who disappeared while working in Voortyashtan. And it’s all well paced and fascinating and ably told and plotted, even if I’d argue (in a minor, minor quibble) that the big question of “who” is pretty easy to spot. And if you want to read an excellent fantasy with great world-building, good plotting, a wonderfully rich premise, and fluid, precise prose, then City of Blades will more than meet your needs. But it goes so much further than this, provides so much more. And that is what makes this work rise from really good to must-read great. And that greatness resides, as mentioned, in its examination of war and its impact. Because Turyin Mulaghesh was not always a general. Once, she was a sixteen-year-old soldier caught up in the horrors of war on ground level. What is revealed about that experience is one of the core elements of this novel and so I won’t address it in detail, but I will say it is absolutely heart-breaking not only in its real-time occurrence but in all of its echoes downward through time. Nor does Mulaghesh stand alone as representative of war’s life-long impact. We see it as well through Sigurd (also a major character from book one) and Sigurd’s daughter. We see it through Mulaghesh’s fellow officer, General Biswal. We see it in old soldiers who have fought for decades and young soldiers who have never seen combat. We see it in war’s victims. All its victims. Not just the slain, but those who slay. Not just those who died, but those who survived. Not just the dead, but those left to grieve them. Not just the soldiers, but their families. Not just the generals, but the grunts on the ground. Not just the grunts, but those who order them into battle. Not just the killed, but the maimed. Not just the maimed, but those who minister to them. War, as portrayed by Bennett, is a never-ending rain of blood that falls on all, the living and the dead, and stains all it touches indelibly and eternally, a truth that Bennett brilliantly shows us, making use of fantasy’s ability to allow the metaphor to become literal. That element of fantasy is used in fact multiple times. Swords, for instance, as symbols of war (but more than that, though again, I don’t want to spoil things). Or the way, as Faulkner once said, “the past is never dead, it’s not even past.” We see this for instance in how the entire old capital of Voortyashtan lies undersea, still a threat to shipping, and currently being hauled up to create a new harbor. “Dredging up the past” is a wonderfully literal metaphor in a world where the past haunts and stalks characters and entire nations. If you like fantasy, read City of Blades. If you never read fantasy, read City of Blades. If you read City of Stairs, read City of Blades. If you didn’t read City of Stairs, read it and then read City of Blades, or don’t read City of Stairs, but still read City of Blades. I don’t care if you get it by being a cog in the Amazon behemoth or by supporting your tie-dye wearing, tea-swilling indie bookseller whose shop is furnished like your great-aunt’s house. Just get it and read it. Because it’s great. This is an excellent follow-up to the genre-mixing City of Stairs, this time focusing on the legacy of war and violence in both the victims and perpetrators, from the perspective of generals, rank-and-file soldiers, spies, commoners, rebels, and then centering its mystery plot on Voortyashtan, the city formerly ruled by the goddess of war, Voorya, whose Sentinels are armored killing machines that guard a divine afterlife open only to soldiers who have slain enough enemies in battle to be worthy. Once again the setting is a city in the conquered land of the Continent, its Saypuri occupiers, and this time it is foul-mouthed and embittered General Turyin Mulagesh, who is dragged out of retirement to investigate the disappearance of a Saypuri operative, some mysterious murders, a strange mining operation, and rumors that some of the divine objects of the dead goddess Voorya still seem to retain some power. This time Bennett delves even more into the difficult territory of why humanity seems so intent on repeating the legacy of past violence and subjugation, with or without divine assistance, and so the story is far more emotionally raw than the first book, and the final third of the book is filled with pain, tragedy, and death. But it done is such a gripping way that it is hard to not be carried on by the relentless momentum of the various parties involved. It is hard to identify the “good” and “bad” characters, as all of them have their light and dark elements. And unlike “grimdark fantasy,” they are not mostly just ruthless and cynically-motivated, this is rather the book that questions that mindset and puts a spotlight on how even when we try to do right, our military actions inevitably result in victims, including those just carrying out orders. It’s a tough perspective to embrace, even in a fantasy context, but it flows naturally from the world that Bennett has created in such vivid and careful detail. He has put a great deal of thought into making this world believable, and is not afraid to tackle difficult subjects and put his characters, whom we come to care for, through some very harrowing experiences that will leave them scarred forever afterward. 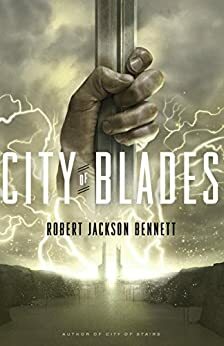 So while City of Blades was quite a challenging book, it raises intriguing possibilities for the final book in the trilogy, City of Miracles, as it is clear that Bennett is not afraid to challenge both genre conventions and limitations in both his characters’ emotional depths and the socio-political worlds they inhabit. I might take a bit of a break first, but I am looking forward to the final installment in his DIVINE CITIES series. Publication Date: January 26, 2016. A triumphant return to the world of City of Stairs. A generation ago, the city of Voortyashtan was the stronghold of the god of war and death, the birthplace of fearsome supernatural sentinels who killed and subjugated millions. Now, the city’s god is dead. The city itself lies in ruins. And to its new military occupiers, the once-powerful capital is a wasteland of sectarian violence and bloody uprisings. So it makes perfect sense that General Turyin Mulaghesh— foul-mouthed hero of the battle of Bulikov, rumored war criminal, ally of an embattled Prime Minister—has been exiled there to count down the days until she can draw her pension and be forgotten. At least, it makes the perfect cover story. The truth is that the general has been pressed into service one last time, dispatched to investigate a discovery with the potential to change the world–or destroy it. The trouble is that this old soldier isn’t sure she’s still got what it takes to be the hero. great review! I’ll do my own soon (only because I have to for netgalley) but there’s really nothing to add to this save I’m in total agreement that this is my first lock for the Best of 2016. I, for one, would have loved to see you both resort to shameless fangirling. :) Great review, and I’m really looking forward to your upcoming interview with Bennett! I keep loving the love this series gets on here!